Thinking about Disney in terms of the alphabet is always fun. Of course, it is even more interesting when you think a little outside of the box. With Disney Letter “I” there is Iago and even Isabella from Phineas and Ferb, but what other items would I discover when heading back to Walt Disney World via our photo memories? Please join me on a whirl wind tour from our December adventure. Love the “ice cold treat”!! Great photos. I adore your pics. I love the pin trading one! How cute! I just got into pin trading and LOVE it! Imaginative I’s! I could go for the icy cold treat now, Yum!! The popcorn pin trading is intriguing. I’m going to have to search that out next time. Thanks for sharing and for joining in on the DWW Blog Hop fun today! I’m intrigued by the popcorn pin trading as well! Must seek that out next visit. Great shots! Awww… these creative alphabet Disney WWs are my favorite! And you always do such an incredible job of them!! :) It’sa “tough choose” (as my little one says) – but I think my favorite is ITALIAN CARS – yaaaay!! Alright…. those photos made me want to get back to WDW now. I can’t wait. 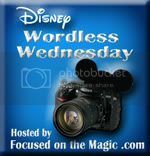 Very “Imaginative” pics of Disney! Love to see them all. Elle´s last blog post ..Fake Tuna Causes What?? WTH??!! Love the italian cars pic! Great group of “I” photos! Love this unique group of “I” photos especially the icy cold treat and Italian cars. Great shots! “Inventive pin trading” Genius! I love all of the pics! Thanks for sharing!